This page will guide you through configuration and basic use of the CRM Connect Microsoft Access Add-in.It is expected that you are already familiar with the Address Book, Call History and Preview window, and the basic concepts of integration and screen popping using the Add-ins.See the 'User Guide' for these topics. Microsoft Access and the database used to store your contact data should already be installed and working normally before proceeding with this integration. Right-click the CRM Connect tray icon in the system tray menu and then left-click the 'Configuration' option from the menu that pops up, this will open the 'configuration' screen.In the 'Integration' area, click the 'Add new' button, select 'Microsoft Access' from the 'Type' dropdown box and then click the 'Set' button. The Microsoft Access Add-in configuration is split into three groups:Database, Field mapping, and Show Contact. On the CRM Connect Database group, first use the 'Browse…' button to select the Access database you wish to integrate with.You can select .mdb and .accdb files. 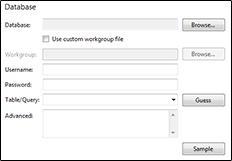 If you want to use a Custom workgroup file just tick the box and select the file from the dropdown list. If the database is password protected, enter the username and password to use to open the database. From the 'Table/Query' list, select which table or query contains the contact data you wish to use.You can use the 'Guess' button to have the Add-in try to guess the correct table or query (based on the name of the table or query). 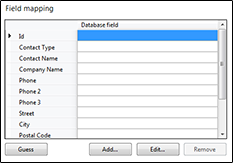 If you need to you can enter your own custom SQL statement in the Advanced box.Usually though, you would create a query in Microsoft Access and just select the query from the dropdown list. If you want to check that you have selected the correct table or query, you can click the 'Sample' button to see the first few records from the table or query that you selected. On the 'Field mapping' group, you will tell the Add-in what the fields in your Microsoft Access directory represent.For example, you might have a field in your directory named ACCOUNT_NUMBER which actually represents the unique Id of the contact. You can either show a form contained in your database, or run a VBA procedure that you have stored in a module in your database. If you want to show a form, the form needs to contain a control that holds the unique id of the contact (the field that you have mapped to the Id field in the Add-in).This control needs to be visible and enabled.Select 'Show Form' from the 'Action' box, and choose the name of the form in the 'Name' text box and the name of the control that contains the unique id in 'Id control'.If you press the 'Guess' button, the Add-in will load the database in Access and attempt to guess the correct form and control. If you want to run a procedure, select 'Run Procedure' from the 'Action' box, and choose the name of the procedure to run in the 'Procedure' text box.You can send arguments to the procedure by filling in the 'Arguments' text box (usually you will want to send the id by entering %Id%). To test if the configuration worked, enter a phone number from your Microsoft Access account into the 'Telephone' box in the 'Integration test' area and click the 'Search' button.The results will be displayed after a few seconds.